This sleek, minimalistic design provides a stylish way to preserve and extend the lifespan of your seats. Our high quality fabric with 3mm of breathable foam backing is soft to the touch and disperses heat, keeping you comfortable and cool on even the hottest summer days. • Sustains your automobile interior upholstery. • Concealed Velcro opening and adjustable straps helps installation, removal and reattachment • Compatible with removable headrests only. • Durable stretchy fabric. • Engineered to accommodate traditional and heated seats. • Semi-customized to fit most vehicles. • Material is breathable. Machine Wash and Air dry. 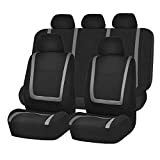 This full set includes two (2) bucket seats and one (1) rear solid bench, 5 headrest cover.